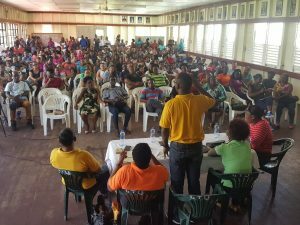 Guyana Teachers’ Union President, Mark Lyte (standing) addressing teachers at the GTU’s headquarters on Woolford Avenue, Georgetown. As thousands of teachers prepare to go on strike for increased salaries and allowances, the Guyana Teachers Union’s (GTU) executive on Monday said the trade union could not afford to provide cash relief but would assist with foodstuff and other items. 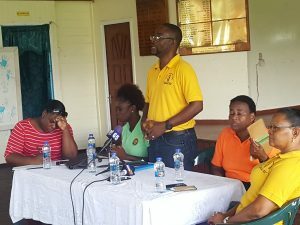 The issue of strike relief was raised at a meeting between the executive and hundreds of teachers at the GTU’s Headquarters, Woolford Avenue, Georgetown, but it was discussed at a closed-door session away from the glare of the media. The union has rejected government’s offer of GY$700 million to pay increased salaries only for 2018 and GY$200 million to readjust salary scales for some long-serving and more qualified teachers. The union instead wants a multi-year agreement from 2016 to 2020. Three teachers who were at the closed door session told Demerara Waves Online News that the executive told those gathered that the GTU could not afford to disburse cash relief. “If the teachers are in a struggle and the teachers agree, don’t even think about that because the union will not be able to support that right now but they have persons who are willing to give us foodstuff that we would be able to give to people who are in need and the teachers agreed to that,” one of the teachers said on condition of anonymity. GTU President, Mark Lyte told reporters after the open-door meeting that he could not give a definitive answer on whether strike relief would be provided to the more than 7,000 unionised teachers “because we have to look at our capacity to offer strike relief”. Guyana Teachers’ Union President, Mark Lyte. Teachers last went on strike 15 years ago, and now teachers pay an estimated GY$700 per month in union dues, amounting to an estimated GY$4.9 million monthly or GY$58 million annually. Lyte was asked why the GTU could not provide strike relief. “The union has other expenses that we have to take care on a monthly basis – maintenance of our properties, conferences- so we have a lot of other expenses that resources are used for so it’s not monies just saved for an event of this nature and you know if you’re offering strike relief, it’s a large sum,” Lyte said when asked by Demerara Waves Online News. The GTU President also said legal advice would be sought on whether an injunction could be filed to prevent government from deducting monies from teachers’ salaries for days not worked because such form of industrial action is lawful. Lyte said even if teachers who are not unionised would still be represented by the GTU because those non-unionised workers also benefit from increases that emerge from negotiations with the employer.